Have regulators in other sectors learned the lessons of the bad bankers? OFGEM's piffling "record" fine on energy firm SSE for mis-selling suggests not. In the first week of April 2013 out came three reports two detailing naughtiness and incompetence in banks, Barclays and HBOS, and one in the energy supplier SSE. All three showed deeply ingrained recklessness in the pursuit of profit. While Britain has stood gobsmacked at the greed of bankers, are we missing the fact that what started in the City has infected other industries and professions? Letting bankers off their leashes by deregulation in the 1980’s, leaving no effective restraint on rip-offs nor on remuneration, sent a strong message to all other sectors. The message was no matter what you did, if you were paid a lot you must be good. And there is no body in Britain who will stand in your way. 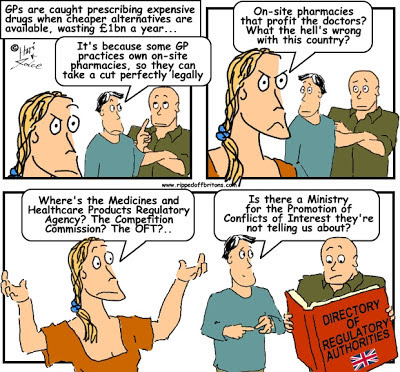 “Family doctors' hours have been cut and their productivity has fallen at the same time as some received up to 58 per cent salary increases" Commons Public Accounts Committee. The strategy set by the Board from the creation of the new Group sowed the seeds of its destruction. HBOS set a strategy for aggressive, asset-led growth across divisions over a sustained period. This involved accepting more risk across all divisions of the Group. Although many of the strengths of the two brands within HBOS largely persisted at branch level, the strategy created a new culture in the higher echelons of the bank. This culture was brash, underpinned by a belief that the growing market share was due to a special set of skills which HBOS possessed and which its competitors lacked. This aggressive strategy boosted director pay in 2006 & 2007. Naturally pay dipped when HBOS burst into flames in 2008. 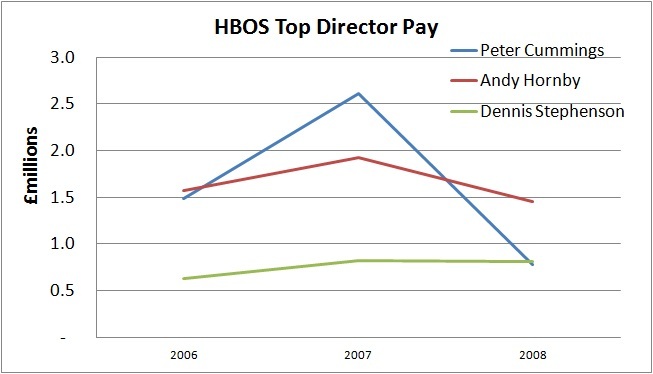 But even in 2008, when HBOS crashed, the directors' pay was boosted by a 'biennial incentive plan' jackpot. This biennial bonus was invented by HBOS' remuneration committee to provide an additional bonus on top of the annual bonus, reflecting the longer term performance over 2 years. So, for 2007-2008 biennial the directors only pocketed half the bonus - just for 2007, such was their remorse for the catastrophe in 2008. The biennial cash incentive 2007/2008 comprises only the element earned in 2007 but deferred and includes Peter Cummings £79,000 (2007 £172,000), Jo Dawson £72,000 (2007 £156,000), Mike Ellis £20,000 (2007 £nil), Philip Gore-Randall £19,000 (2007 £nil), Andy Hornby £121,000 (2007 £254,000), Colin Matthew £73,000, (2007 £160,000), Dan Watkins £54,000 (2007 £42,000), Former Directors £149,000 (2007 £311,000). The Directors waived their rights to any payment in respect of the 2008 element of the scheme. The directors took a bonus for the catastrophic strategy they pursued before 2008, and "waived their rights" in respect of the 2008 element! We should not thank them for their abstemiousness. We should ask the Remuneration Committee what tortured bonus scheme formula even gave them bonus rights to waive in that disastrous year. The Commission considers it a matter for profound regret that the regulatory structures at the time of the last crisis and its aftermath have shown themselves incapable of producing fitting sanctions for those most responsible in a manner which might serve as a suitable deterrent for the next crisis. The FSA was famously supine. When Hector Sants as FSA chief executive said in 2009 "People should be very frightened of the FSA", the banks laughed. In spite of, or perhaps because of, all the laughing, Barclays Bank in December 2012 gave the same Hector Sants a job at a reported £3million per year. 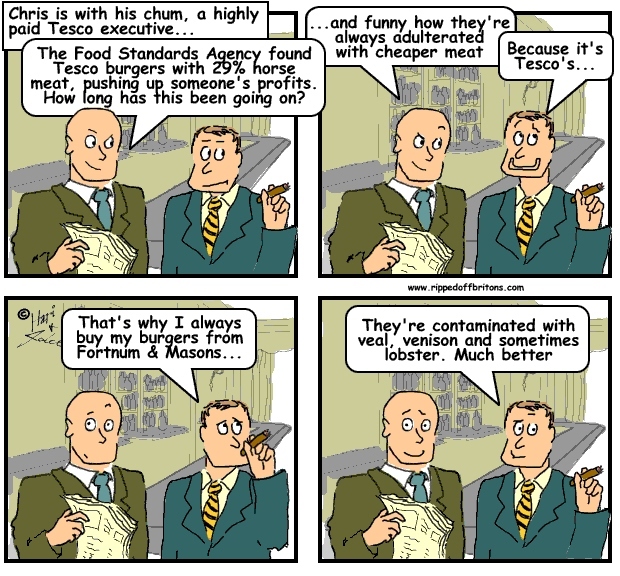 Perhaps the FSA was just the cowardly runt in the litter of regulators, and the others are much bigger scarier dogs? Sadly not. Just as banker greed infected the other industries, FSA uselessness is woven into the DNA of the other industry regulators in the UK. Consider OFGEM's ‘record’ £10.5million fine on the energy company SSE for mis-selling domestic energy deals. SSE have, of course, apologised for their abject behaviour. The fact that the apology was extracted by the spineless OFGEM demonstrates that there was not even a whiff of smoke nor a wisp of a veil for SSE to hide behind. Not that SSE didn’t duck & dive for as long as it possible could. "We want to reassure customers, and potential customers, that this case relates to sales aids used in February 2009, which are not in use today, and we are confident that our sales processes continue to be fair and responsible." "taken together, SSE’s contraventions extended over a significant period of time. Certain of the breaches began in October 2009 and a number of them did not conclude until September 2012. A number of specific contraventions extended beyond 1 year, some beyond 2 years, and one breach had persisted for some 3 years at the time of the Authority’s decision"
OFGEM found that SSE scams that included misleading sales scripts, and the fact that "in relation to doorstep sales, the main auditing was carried out by local managers who received commission on sales and therefore had a financial interest in not reporting misbehaviour" were not "accidental or inadvertent”, and so were presumably deliberate. The Authority does not consider that the breaches in this case were accidental or inadvertent: in particular, establishing appropriate systems to monitor and remedy mis-selling was a matter which was entirely within SSE’s control and its failure to do so constituted a significant aspect of its breaches of its licence conditions. the maximum cap on penalty, which is 10% of the turnover of the legal entity holding the relevant licence. A quick look at the FT shows SSE's turnover in 2012 was in excess of £30 billion. 10% of turnover would be a £3 billion fine. Even the banks haven't been fined so much, so perhaps this is too harsh? So let's forget revenue: how about 10% of profits? A quick look at SSE's own corporate statement shows profits in 2012 of £1,335.7 million. 10% of which would be £133.6 million. 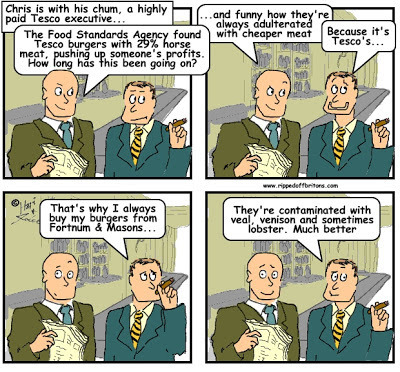 So we see that OFGEM's £10.5 million fine is less than a pip squeaking. The OFGEM fine on SSE is 0.8% of profits, and 0.03% of revenue. 3 hundred times smaller than it could have been. Once again Britain's regulators have shown that ripping-off Britons is acceptable as taking water from a tap so long as you pay your water bills. Paying fines is just another cost of doing business. OFGEM's courageous announcement that the energy companies are 'awful'! Doubtless Npower and SSE are trembling: Behold ye mighty and despair! Ofgem has made it clear that complaint handling by energy companies is frankly awful. We've told suppliers to get their act together and explain to their customers by the end of October what they are doing to improve their procedures. We are already formally investigating Npower about complaint handling and other customer service issues and this should send a strong signal to all suppliers that we are ready to take action to drive up standards. 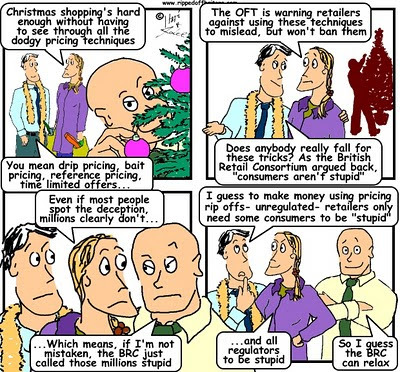 The Energy Ombudsman was set up by Ofgem as a backstop for consumers, but it's suppliers responsibility to get complaint handling right in the first place. We want to see greater awareness of the Ombudsman service and we are pleased they are working to address this."